First thing to be said about the Haven series is that the books are very easy to read and they do not take long to finish. In this case, easy is meant as a compliment. Both Once Bitten and Twice Dead are addictive. I’ve read them a couple of times and enjoyed them just as much each time. Both are heavy on action and low on romance (although there is plenty of tension between the two main characters). Kalayna Price has done herself proud. Young Kita is about to discover what it means to be both shape-shifter and vampire. Or does being a vampire cancel out being a shape-shifter? She is also about to discover what it means to crave blood. Let us just say that the longing makes her nauseous. Once Bitten is the first novel in the Haven series. 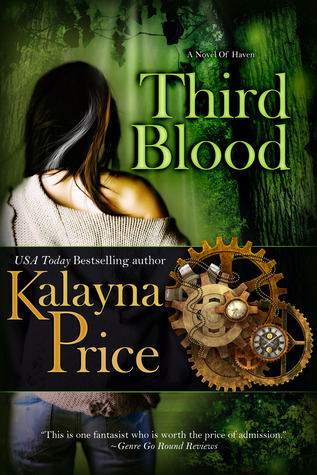 Kalayna Price is the author of this series. Her books tend to be in the supernatural/ romance/action categories. So too in Once Bitten. Kita is on the run from Firth, a parallel world for shape-shifters. Her shape is a cat. In spite of her small size she is Dyre (the one to inherit leadership) and her father Torin. Female shape-shifters are forbidden Earth, which is why there are hunters on her tail. But Kita does not want to go back. Her running takes her to the city of Haven, and Haven takes her into the world of vampires and scholars (magicians). Once Bitten is pretty much about Kita’s entrance into the world of vampires and the impact the change has upon her and her vampire sire, Nathaniel. Both Once Bitten and Twice Dead are urban fantasies set in the city of Haven. I found Twice Dead as good as Once Bitten. They are both light, easy, action-filled and fun to read. Kalayna manages to make her characters pretty three-dimensional (especially our main one – Kita). Focus is not placed on world building but on character building. In a novel of this length I find that wise. In Twice Dead Nicholas is chastised and punished for not making Kita drink enough human and master blood. She is still a cat at heart and really finds the idea repugnant. Rabbit blood is OK, but human? No way. Therefore, the choice is taken away from her. When the Collector comes to town wanting to question Kita about the deaths in Once Bitten, other deaths begin happening. Vampires are discovered without their heads attached and Kita is being framed for them. Twice Dead is pretty much about resolving the mystery surrounding these murders, staying away from the hunters from Firth and trying to keep Kita alive. Enjoy. THIRD BLOOD (2012) – Not yet published. I just wanted to show the planned new cover. Great, huh? Where is third blood??? Please!!! Sorry, the author has not yet published it.